Buy More Butterfly Pull Bows Save More! 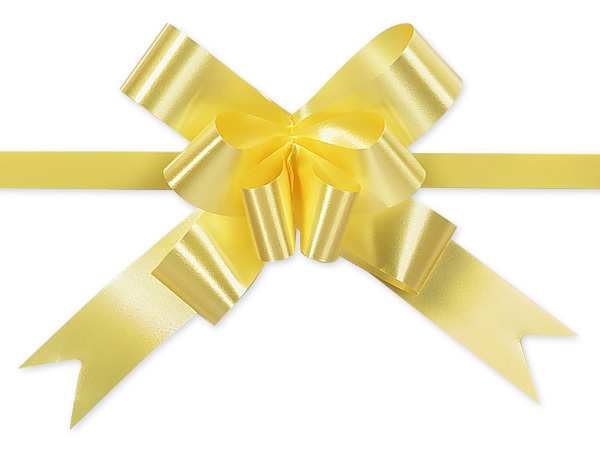 4" Yellow Butterfly Pull Bows are an effortless way to spruce up a small to medium gift box or cellophane basket bags. They are 100% polypropylene, so they offer shine and durability. The ribbon on the bow is approximately 7/8" wide and, once assembled, the ribbon tail is 19 3/4" long. The total bow length is 4". Butterfly Pull Bows are a quick and easy way to add appeal to your gift packaging. Offered in the four classic colors of green, white, gold and red, these pull bows will add value to your gift presentations throughout the year. 1. Unfold bow and open ends to locate narrow pull strings. 2. Hold pull strings together with one hand and slide plastic ring away from you with the other hand to form bow. 3. Tie pull strings together at base.